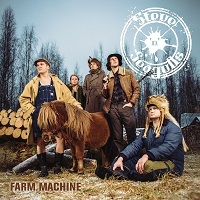 Your CD Farm Machine <Review> was released on May 8th, 2015, through Spinefarm Records. How are the reactions, are you satisfied with the feedback you got from the fans and the press until now? I must say the press feedback has been better than anticipated. When we finished making the album we all agreed it sounded right to us and most of our listeners would probably enjoy it, too, but we were a little concerned what the media response to a fulllength cover album would be. Then again, don’t philharmonic orchestras do mostly covers as well? Could you please introduce you and your band mates, and describe each of you in two-three words? I myself go by the name of Pukki Kaalinen, or just Pukki. I’m a double bass player who does some singing too, and a notorious Besserwisser. My band mates in alphabetical order are: Herman, the banjo and acoustic guitar player/singer, known for his love for good cuisine and keeping his feet warm; Hiltunen, who plays the accordion, mandolin and keyboard and possesses the ability to fall asleep while talking but wakes up at 4am; Puikkonen, the drummer/singer with tireless jaws and a distinct voice; Remmel, singer/acoustic guitar and mandolin player, orienteer and a heavy user of German sportswear. When and how did you come up with the crazy idea - “crazy” meant in a very positive way! 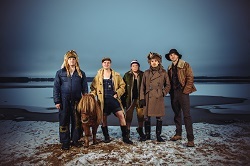 - to cover Rock & Metal songs in the Bluegrass style, and to choose Steve 'N' Seagulls as your band name? Well, the idea of doing famous songs in another style is nothing new, and we had obviously heard acts like Hayseed Dixie, Iron Horse, Richard Cheese, The Baseballs and so on. 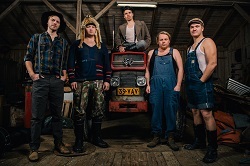 At first Steve ’N’ Seagulls was meant to be a side project, but we had too much fun with it and discovered we had our own sound. Apparently there’s room for one more! It’s stuff we like, mangled with love. Did you actually get the OK for all songs that you've chosen for the album? I suppose so. The record label took care of that. Your voices fit together perfectly. You're covering some English songs, but also one in German. Rammstein's Ich will. It sounds great - could you please tell us who the singer is? And could it maybe be possible to find a Finnish coversong on the second album? Remmel, Puikkonen and Herman do most of the vocal harmonies and I join them occasionally. We have spent a lot of time working on them, so thanks for the recognition! I did lead vocals on Ich Will, mainly because none of the others speak German and we just had to have a Rammstein song. Now, personally I think we should do a Finnish cover at some point but it’s too early to promise anything! I'm also quite impressed by how you are playing your instruments, like banjo, mandolin, accordion, acoustic guitar, contrabass and cajon. Which one(s) do you play? Scads of clicks for your clips, an album, gigs at Wacken and Sweden Rock are listed in your tourschedule... The past months must have felt like a fairy tale for you and you must be over the moon, surely. But do you also feel a little scared by the overwhelming response, for whatever reason? True, the past few months have been great for us and we’ve had audiences like never before, and yes, we are really looking forward to this summer! But even though conditions improve the actual job stays the same: sitting in a vehicle, carrying boxes, unloading boxes, waiting, soundcheck, waiting, playing the gig, loading boxes, carrying boxes, sitting in a vehicle. Naturally we’re now under more pressure because people have expectations, but that’s kind of exciting. That wasn’t the case before. The short England tour we just got back from was a real confidence boost for us. We played in fairly small venues but the response we got was heartwarming and we’ll definitely be going back. That said, bigger stages mean bigger expectations and that does make us a little nervous, but that’s mostly a good thing, I guess. Keeps us from turning lazy. Did you ever expect to receive such great response after filming the video in 2014 and uploading it to YouTube? What were your personal very special moments respectively your highlights with the band in the last months? Finishing the album just before new year and of course its release a couple of weeks ago. Then there was the England tour, which was our first “real” tour abroad. But also getting our asses kicked in ice hockey by a few players from the Finnish women’s national team was really special! I can’t imagine ever getting that experience if it hadn’t been for a video. In which age you´ve started to play an instrument, and which bands/musicians/singers would you name as your greatest influences? I started with the electric bass probably at around 12 or so. I had been playing some piano before, but not that much. Naming my greatest influences is way too difficult! They are from such different genres. However, to not be completely boring about it, I’d have to say that the first two CD’s I owned as a kid were Iron Maiden’s Fear Of The Dark and AC/DC’s Razor’s Edge so I guess they set the direction for a few years to come. They change on a weekly basis and I don’t even listen to whole albums that much these days, just look for good pieces. Right now I’d say Sanguis Meus, Mama! 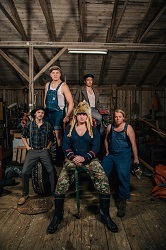 by Pekko Käppi & K:H:H:L, Unrest In The Wolds by Folk The System and Huuro Kolkko by Alamaailman Vasarat. Not really, It’s time for bed! Kiitos haastattelusta! We wish you all the best, much success with the CD and lots of fun on tour! Vielen Dank! See you on gigs some time!